Not one of Jaime Glas’ coworkers was surprised when Glas, nicknamed “Aunt Sparkle” by her friends’ children and “Fashion” by her senior manager at Chevron, left her career as a petroleum engineer to design her own line of functional yet flattering flame-resistant clothing for women. “I always sort of dressed a different way,” says Glas, who had a habit of donning bright colors and crazy heels in a world where sensible shoes are the norm. Graduating from LSU in 2012 with degrees in petroleum engineering and international trade and finance, Glas’ distinctive style and head for business married in a way she never could have expected. Today, the 30-year-old is the founder and owner of two apparel brands called HauteWork and Sparkle City. The companies are as unique as the customer bases they serve. First came HauteWork, an upscale brand of flame-resistant coveralls and jumpsuits custom designed for women. Best-selling colors include turquoise and purple, while the most popular product is the flex suit, a fire-resistant jumpsuit with a hood that zips into the collar, Glas says. Jaime Glas (left) and her Sparkle City partner Margo Cory. Photo courtesy Jaime Glas. Glas came up with the idea for HauteWork when, in 2010 as an engineering intern in Bakersfield, California, she first tried on men’s flame-resistant coveralls. As a petite woman, Glas says she was “drowned” in the outfit. “It was definitely a safety hazard but it was also just so unflattering,” Glas says. Glas decided to design flame-resistant clothing that was fashionable, safe and tailored for women. It took years of working nights and weekends to bring her idea to fruition while she worked full time, but Glas launched HauteWork in 2017. The response was swift. She began receiving emails of thanks from women in the oil and gas industry. By late 2017, Glas decided to devote all her time to HauteWork and left her engineering job in Austin to return home to Baton Rouge. Her second company, Sparkle City, was born last fall when Glas teamed up with friend Margo Cory to create a fashionable line of sports apparel for women. “There really aren’t good clothes for a trendy and fashionable girl or woman that represent a sports team,” says Glas. 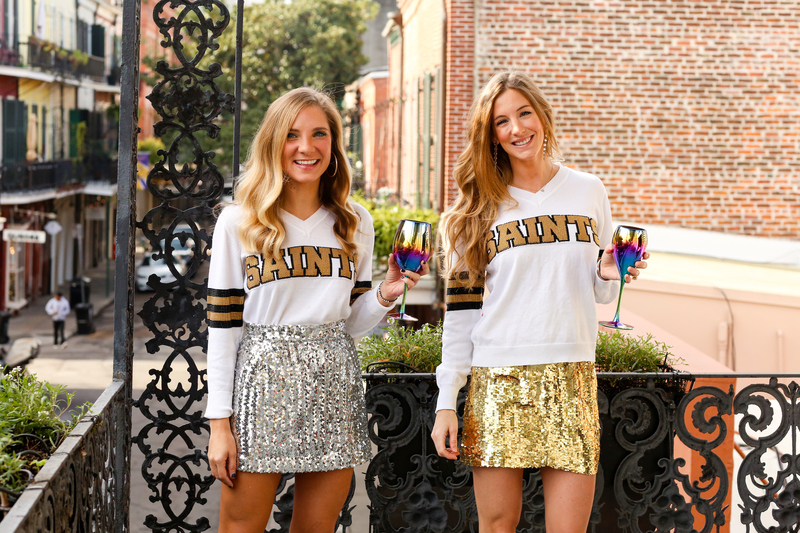 Today, Sparkle City sweaters are sold at boutiques including Hemline in Baton Rouge as well as shops across New Orleans. So what’s next for HauteWork and Sparkle City? Last year, Glas was awarded a grant from petroleum refiner Valero to design a line of maternity flame-resistant clothing. She is also seeking a distributor in exchange for exclusive distribution rights and part ownership in HauteWork. As for Sparkle City, Glas says she and Cory hope to expand their line to include nationally known college and professional sports teams by fall 2019 as well as provide glamorous holiday options.